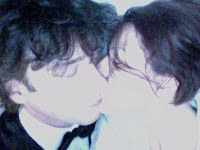 I don't tend to follow/report gossip-y stuff like this, but it would appear that Neil Gaiman and Amanda Palmer are engaged. What surprises me more than anything is that I, "Comics' #1 Fan", caught this through Palmer's music blog before any comic-related blog or news outlet. So, uh... congrats to Gaiman and Palmer, I suppose.